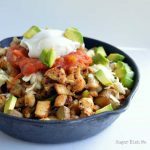 One pot and 30 minutes is all you need to turn out this delicious and easy dinner! One Pot Chicken Tomato Pasta is a weeknight win! Soooooo… it’s definitely time for a Fast Food Friday recipe. The wedding had me in the weeds there for a minute but I think I’ve just about mowed my way out. 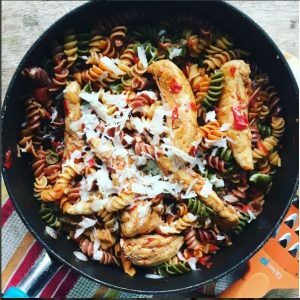 This week I made us this super simple one pot chicken tomato pasta using canned and fresh tomatoes, as well as garden delight rotini. Something about eating the veg-blend pastas makes me feel better about carbs. Anyway – if you have a bumper crop of tomatoes, bought too many Romas for pico, or just have a couple of cans hanging around, this one’s for you! Heat the oil in a large deep skillet or dutch oven. Add the chicken and sprinkle it with salt and pepper. Brown the chicken on both sides over medium high heat for about 4 minutes total. Reduce the heat to medium and add the garlic. Cook for less than a minute (just until it's good and fragrant) and then add the tomatoes and Italian seasoning. Continue cooking for about 2 minutes. Then add the pasta and water. Turn the heat up just a little so the water can come to a simmer. Stir occasionally to keep the tomatoes and pasta from sticking to the pan, and continue cooking for 15 minutes, or just until the pasta is tender. Garnish with shredded cheese and crushed red pepper if desired. Italian Seasoning Blend: if you don't have this just use some dried oregano, dried basil, dried parsley, a tiny bit of garlic and/or onion powder, or any combination of these. 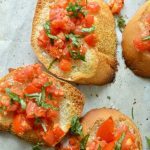 You can also opt for the seasoned canned tomatoes if you don't feel like fooling with it, but I always prefer to season things myself. I need Fast Food EVERY DAY! This pasta is the perfect place to start!! Looks like the perfect weeknight dinner! How much water should I add to cook the pasta? YUMMY!! 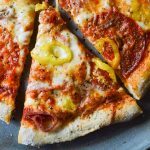 I printed this out and added it to my go-to one-pot recipes for those busy days! Thanks a bunch! This looks like such a tasty dinner! 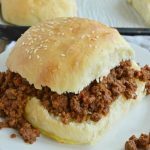 And I’m always looking for quick recipes for busy weeknights! Do i understand this correctly, that you add the water to the pan with the seasoned chicken and tomatoes? This looks so good but I keep rereading it to make sure it is all one pot.